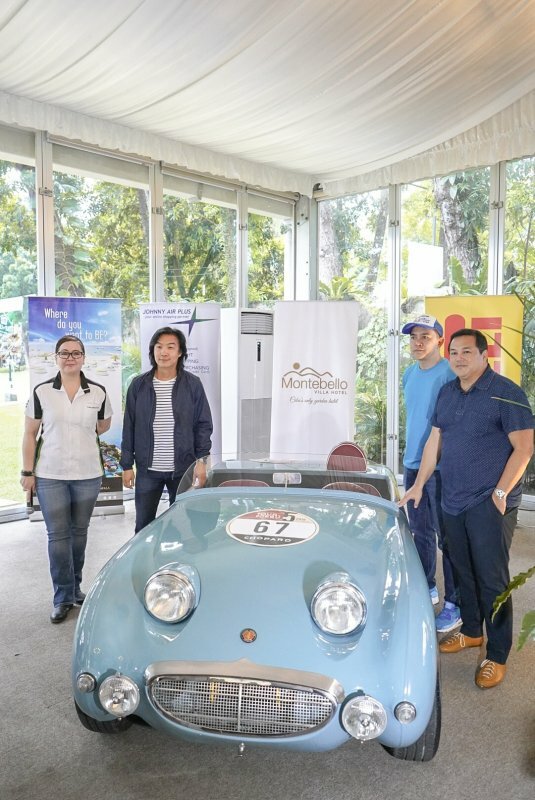 This 1955 Austin Healey Sprite was one of 38 rare and exotic cars that were placed on exhibit right before the 5th Tour de Cebu heads off to Tubigon, Bohol. In this photo are Tradeshow International Inc. CEO & President, Sophie delos Santos, founding member Kenneth Cobonpue, Tour de Cebu Technical Director Pepon Marave and PACE founder Jay Aldeguer. If anyone thought that the 5th Tour de Cebu was a mere exercise in pomp and pageantry, they couldn’t be any farther from the truth. This, the race’s technical director indicated after he found over 40 kilometers of yet-to-be-traversed roads that the drivers would be hard-pressed to run their cars on in the fifth edition of this much-anticipated regularity rally, which kicks off on Friday when the cars make their way to Tubigon, Bohol. According to the race’s technical head, Pepon Marave, the challenge lay in giving drivers new challenges as they spend a third straight year on the same roads. “It’s a challenge for us to make things more challenging. I’m happy that I found 40-kilometers of new routes that will surprise the participants. It will be more difficult especially during the first day when they have to go 334 kilometers straight. It’s a big challenge for the driver, the car and the entire team. The car’s reliability and the drivers’ stamina will be put to the test,” said Marave during the event’s press launch earlier in the week at Montebello Garden Hotel. Organized by the Performance and Classic Enthusiasts (PACE) club of Cebu, the most exotic cars in the country hit the road and make their way across Bohol and then, back to Cebu again in a span of three days. Marave revealed that he also took away road signs to make things even more difficult for the drivers and their teams, leaving them to use running notes that would be given to them. PACE founder Jay Aldeguer and founding member, Kenneth Cobonpue joined Marave on the podium. “There is no air conditioning. The brakes are old, the cars are not as well insulated. The whole car shakes when they run at high speeds so you’re really hanging on to dear life. It’s no different to running a marathon in that it requires a lot of skill. It’s you and the machine and the road, that’s the beauty of this experience,” Cobonpue disclosed. Car enthusiasts actually got a glimpse of the exotic vehicles when they were made accessible on Thursday afternoon at the parking area of the Montebello Hotel. Already in its fifth year, the Tour de Cebu is the country’s only 1,000-kilometer historic sports car rally that is being staged across the Visayas. It takes inspiration from the Mille Miglia – a 1,000-mile open-road endurance race that is held Italy.